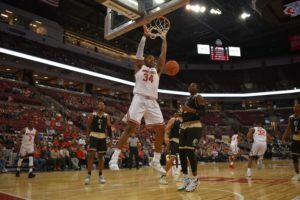 The Ohio State men’s basketball team welcomed back Kaleb Wesson from suspension, and the sophomore center led the Buckeyes to victory against Indiana, 79-75. Kaleb Wesson served a three-game suspension for violating athletic department policy, and the Buckeyes were winless in his absence. Ohio State performed poorly without its starting center, ranking last in the country in effective field goal percentage throughout the stretch. The Westerville (Ohio) South product wasted no time making his presence felt, scoring Ohio State’s first points on a pair of free throws and knocking down a three-pointer to give the Buckeyes an early 11-5 lead. Kaleb Wesson led the Scarlet and Gray with a 17-point, 13-rebound performance with the season on the line. The Hoosiers had difficulty stopping the Westerville, Ohio, native, but did what they could to slow him down. Indiana frequently sent double teams at Kaleb Wesson and attempted to draw fouls against the Buckeye big man. Displaying his versatile skill set, Kaleb Wesson kicked the ball out to the open man, often leading to an open basket. He contributed three assists and added more hockey assists, where his pass indirectly led to a bucket. The pressure of Indiana’s defense, and perhaps a little rust, caused Kaleb Wesson to shoot 5 of 15 from the field and 1 of 4 on three-pointers. However, the 6-9 center showed composure at the line, knocking down 6-of-7 free throws. Ohio State head coach Chris Holtmann said rust could not be used as an excuse because Kaleb Wesson went through workouts and practices while suspended. Although he missed three games, Kaleb Wesson was able to stay connected with his teammates during his suspension, which proved to pay off. Holtmann had said his big man’s endurance would be a question mark because of the inability to simulate game speed. In his first game back, Kaleb Wesson (6-9, 270) did not appear to suffer from additional fatigue, playing 34 minutes and making plays against Indiana from start to finish. In addition to a complete performance offensively, Kaleb Wesson contributed three blocked shots and two steals on the other end. Holtmann said Kaleb Wesson’s return impacted the Buckeyes defensively as much as it benefitted their offense. “He’s gotten better with that,” Holtmann said of Kaleb’s post defense. “But what I’ve said about him since the very first day I coached him is he’s really smart defensively. He’s been coached well in high school. He just sees things early, he doesn’t always get there in time, but he sees things.